Coyote is a brand that can be trusted when it comes to electric bikes and if you are looking for a bike that is going to cater for your travel arrangements, then you may want to have a look at the Coyote Energy Folding Electric Bike. All electric bikes are pretty expensive whichever way you look at them, but the Coyote Energy Folding Electric Bike (Learn More Here!) seems to do a lot more for less. In terms of durability and features, electric bikes don’t get much better, but this bike by Coyote offers a lot more. This bike was designed to not only offer a comfortable experience during longer travels, but also the ability to get you where you want, and get you there quicker. Quicker performance – Coyote wanted to not only manufacture a bike that was lightweight and durable but they wanted one that could keep up with the rest of the electric bikes on the market. They have achieved this thanks to the alloy frame and the brushless motor that allows this bike to reach up to speeds of 15.5mph – which makes it considerably quicker than other electric bikes on the market. Hybrid Brakes – One of the best brakes on the market are the hybrid brakes. They not only provide users with quick braking times but also the ability to last. These brakes are some of the most popular on multiple electric bikes so you can be sure you are going to be safe during travel. Foldaway – This bike is jam packed with many features which is why many people ultimately think this bike is big and bulky. That isn’t the case thanks to its overall weight of 18kg and Coyote have even found a way to make this foldable. Quick charge – Coyote made quicker charging times one of their main priorities and with the introduction of their battery powered brushless motor they have been able to do just that. This means users aren’t waiting overnight before they can use the electric bike again and are expected to wait just a few hours until it’s fully charged. Brushless motor – Brushless motors are found on a lot of battery powered products, whether they are electric bikes or power tools used in the construction industry. You can be sure of the best performance thanks to the introduction of the brushless motor, and you will have an electric bike that is going to last longer. Long range – Thanks to all of the features jam packed into this electric bike, such as the brushless motor and the alloy frame, means users will be able to travel up to 15 miles with one charge. This is great for people looking to commute without using lots of electric. Lightweight – This electric bike only weighs 18kg, so you can be sure storage is easy and travel times are quicker than other electric bikes on the market. This electric bike was designed with an alloy frame and other light materials so you can be sure it isn’t going to be strenuous work carrying this into storage, wherever that may be. Multiple gears – This electric bike comes with six different gears so whether you are travelling up or down hill, there will always be a gear to suit your needs. This bike will surely keep you in tip top shape when you are not taking advantage of its electric powered capabilities. Large wheels – Coyote wanted to make travelling a lot easier for users which is why they introduced bigger wheels into this design. Many other bikes out there only consist of poor quality wheels that aren’t durable enough for longer journeys. Users will now be able to benefit from the introduction of the 20” wheels. Alloy frame – As with most bikes that aren’t electric, this one also comes designed with an alloy frame that will provide you with a lightweight product. Pedelec System – If you are looking for an electric bike that is going to give you plenty of control and freedom over any journey, you will be happy to know this bike comes with a pedelec system. This means you can turn the electric on and off whenever you want to get a bit of exercise. When this electric bike is compared with other bikes on the market, it’s very easy to see why it’s popular. This product is not only feature rich but it also provides the same quality and performance as a lot of the other electric bikes, but in the more expensive range. 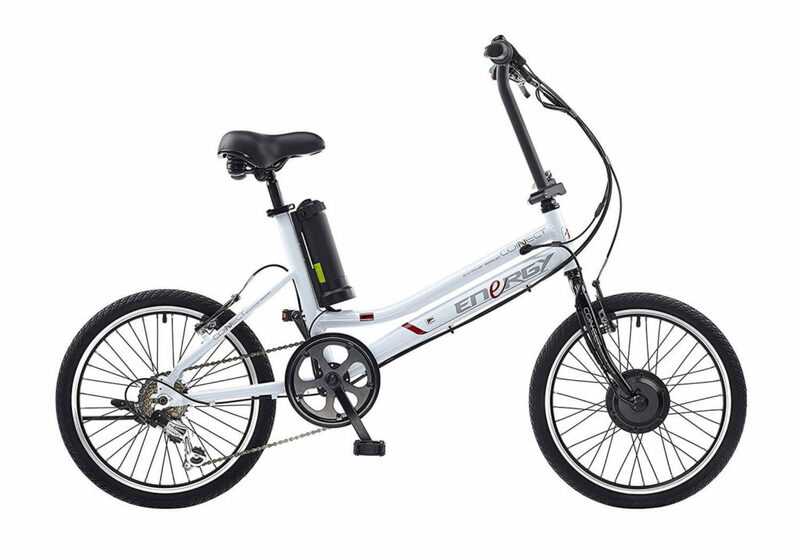 Electric bikes don’t come much better than this one and if you are looking for an electric bike to take care of your travel arrangements then you should definitely consider the Coyote Energy Folding Electric Bike.